What distinguishes us from other tour operators? We seek a form of tourism that treats the natural resources of the country - and its people - with care. 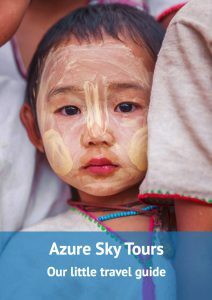 The roots of Azure Sky Travels go back to the ‘Stone Age’ of Burmese tourism: In 2000 the German Dr. Axel Bruns together with a local partner founded the company Bo-Tree Travels in Yangon. In 2007 he separated from his former partner and since then the company bears the name still used today. We are an ‘Inbound Tour Operator’, i.e. we organize tours for guests arriving from abroad. If desired, we’ll take care of your entire stay in the country, from arrival in Myanmar to departure. We are happy to book the flights and hotels as well as the land transport and also provide the tour guide. Of course, you can also book individual services (e.g. flights and cars). Our services are limited to Myanmar, the only exception being Bhutan. 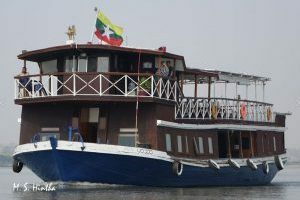 We have recently started to offer this destination because it is so wonderfully compatible with Myanmar. As a rule, we do not sell international flights. If desired, however, we can organize such flights in the region, e.g. to Thailand or Laos. Dr. Axel Bruns, a Berliner by choice and geographer (Freie Universität Berlin), has held a firm grip on the business since the company was founded. He has lived in Myanmar for more than twenty years, and his first visit (as a backpacker) to Myanmar resp. Burma, which was still socialist at the time, dates back more than forty years. It inspired the (then still) young man so much that he could never get the country out of his head anymore. Among them, his Burmese wife Daw Ei Ei Linn is the foremost. She is the owner and the company’s soul. She has been working there for more than ten years and is responsible for the commercial side of the business. Together they have travelled half the world (see the photo taken near the Tiger’s Nest Monastery in Paro, Bhutan). Berlin-born Tobias Esche (M.A. Southeast Asian Studies, Humboldt-Uni Berlin and Political Science (Uni Potsdam) finally joined us in 2014. His grandparents, Dres. Annemarie and Otto Esche, were good friends of Axel Bruns and lived for a long time in Myanmar, where they represented the diplomatic interests of the former GDR. They also wrote several books about the country, among them the excellent ‘Dictionary Deutsch-Myanma’. It goes without saying that Tobias, whose first visit to Myanmar was twenty years ago, followed in their footsteps. He also speaks the national language and his Myanmar travel guide, published by Trescher-Verlag, is especially popular with young travellers. As our data processing had gathered a lot of dust over the years, it was Tobias’ first task to lick it into shape. He has a Burmese driving licence which enables him to travel around the country, thus keeping us up to date at any time. 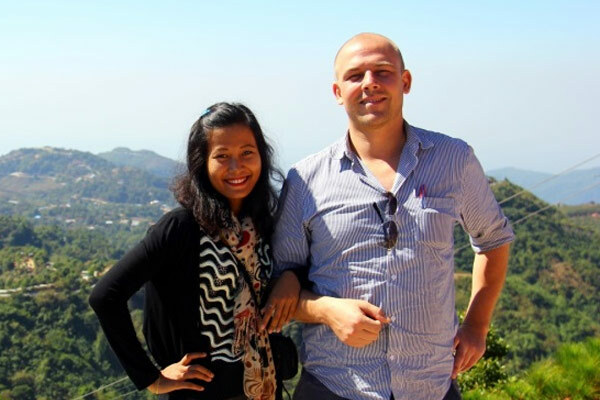 His work brought him in close contact with Htet Htet Aung (see below), our best tour guide. In February 2018 we celebrated their wedding! Why? It’s cooler there than in my hometown of Yangon. In the surroundings of the city one can visit many minorities or meet on the beautiful market of the city. Kalaw is very suitable as a starting point for trekking tours through the beautiful landscape to Inle Lake or to Pindaya. Why? The place is very peaceful and quiet. Nearby you can study the simple life of the tribes. Besides Kalaw is a good place to relax, especially during the hot season in Myanmar. Why? For me, these two places represent a world of their own. Why? Bagan for its ancient culture and pagodas. In Shan State I love nature and the diverse landscapes. Why? I was born here and consider Bagan to be the most important archaeological site in Southeast Asia. Bagan has so many religious monuments that bear witness to historical events. Why? It is a quiet, peaceful place and at the same time enchanting place. Why? Bagan is the cradle of Burmese culture – and my second home! Why? Mandalay is known for its culture, as the centre of the Buddhist faith in the country and as a centre for crafts and fine arts. Favourite place in Myanmar: Bagan! Why? There are many stupas and pagodas there and I can explain their details, history and development to my guests. Our local guides make an important contribution to the success of the trip. We offer our customers two variants: continuous tour guides (also in German!) or so-called station guides (only in English), who receive our customers at the respective destinations, guide them around and then put them back on the plane / bus / train to their next destination. It goes without saying that a continuous tour guide is more expensive than station guides. Most of our guides have been with us for some time and have a lot of experience. Many of them have already been to Germany and have taken language courses there. We support these journeys to the best of our ability by helping to obtain visas, providing guarantees, etc. From time to time Dr. Axel Bruns organizes training courses for tour guides himself. 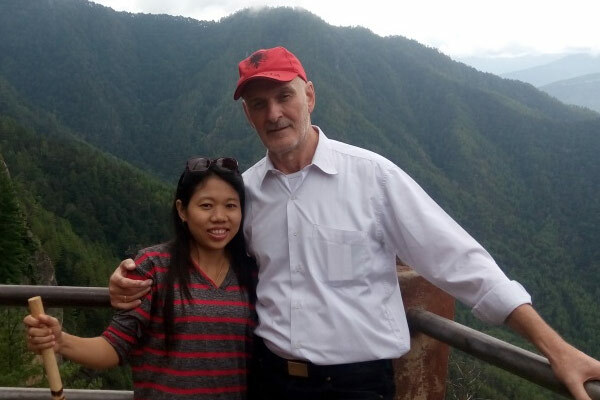 His experience of more than 30 years as a tour guide in Myanmar has been summarized in a booklet called ‘How to be as good tour guide in Myanmar’. He distributes it free of charge to young colleagues and it is rather popular among them. With these guidelines he hopes to build a bridge between tour guides and their clients.